The perfectly pink stippling brush allows you to create a flawless base. Its well-crafted shape and soft bristles allow you to easily blend liquids, primers, creams, mousses and powders. 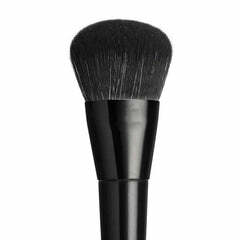 You may also use this brush to apply highlighting powders to accentuate the cheekbones and décolletage. With its premium craftsmanship, this brush offers seamless results, while its vegan bristles offers a cruelty-free way to enjoy your favourite makeup tricks. 19.8cm full length. Bristles - 3.8cm high, and 3cm wide.